I have two topics to discuss with everyone today. Tell you about the Merrell and Onlineshoes Blogger contest that I need your help with and a chance to win some shoes for yourself. Review the Merrell Bare Access shoes I received for the contest. Before I get to the review of the shoes, I'll explain the background how I got involved in this contest. Onlineshoes.com contacted me a couple months ago and asked me if I was interested in doing a review for one of Merrell's barefoot shoes and being in a blogger contest called the Merrell Style Central Contest. Basically the contest is simple. Write about "How Merrell got me outside", post a couple pictures in the shoes and get people to vote for my story. This is where all of you come in!!! I need your help! I need people to go to the Onlineshoes.com website and vote for my story. There are only three other bloggers involved in the contest doing the same thing so I have a 25% chance of winning! I'll be spreading the word on my blog, on my Facebook page and my Twitter account. Anyway that I can to get the word out of my story - that's what I'll be doing. Please feel free to share this with your friends and ask them to vote for me as well. 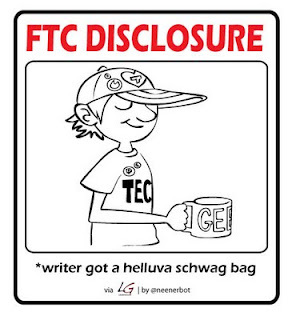 What's in it for me? Of course, I got a free pair of Merrell Barefoot shoes to review. I also received a really nice pullover to run in along with a couple pair of running socks. The Grand Prize for the winner is a $1,500 travel voucher from intrepid travel. How cool is that? I'm counting on you!! All you need to do is go to the website link(contest runs through 9/5): Click HERE ; (will be live later today) vote for me and that's it! By the way, everyone that votes is entered for a chance to win a free pair of their own Merrell Barefoot Shoes. You can choose Womens Merrell Shoes or Merrell Shoes for Men but they will be Merrell Shoes. How awesome is that? They make some great shoes. How my Merrell shoes helped me get me outside. I’m a runner - it’s what I do. I was looking for a great fitting shoe. to get outside to run a bit. 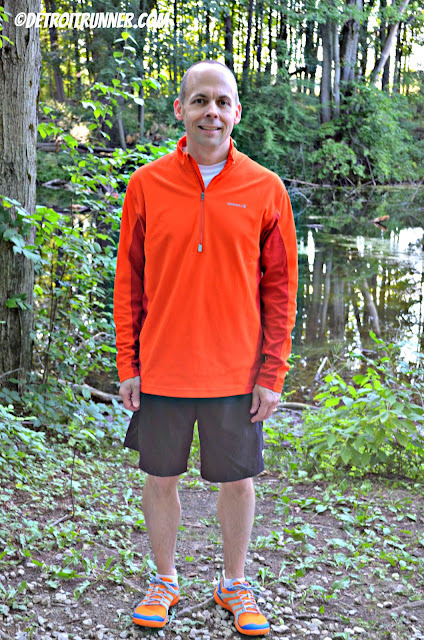 with my Merrell shoes that fit like a glove. to that I know there’s no debate. These guys at Merrell are really smart. So how do Merrell’s get me to run? Their color, fit, and sure are fun. the quality you can’t ignore. and want to run on the far side. Go get some Merrell Bare Access. Haha! Hope you liked it!!!!!! I've been running in these for the last couple months. First impression - BOOM! I love the colors. Of course, I had a choice when I picked them out and I wanted something loud and I sure got it with these. How do you like that bright orange and blue? I can say one thing - when running with these, they sure stand out. Even walking around while on vacation, I got lots of looks and a guy that said he loved them as well. 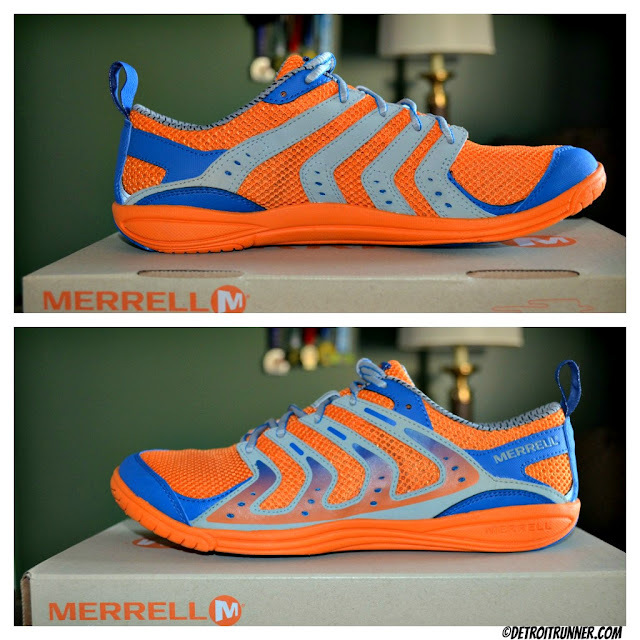 As you may know, I've run in Merrell Barefoot Shoes before - the Merrell Sonic Glove - click HERE for full review - so I knew what to expect somewhat. 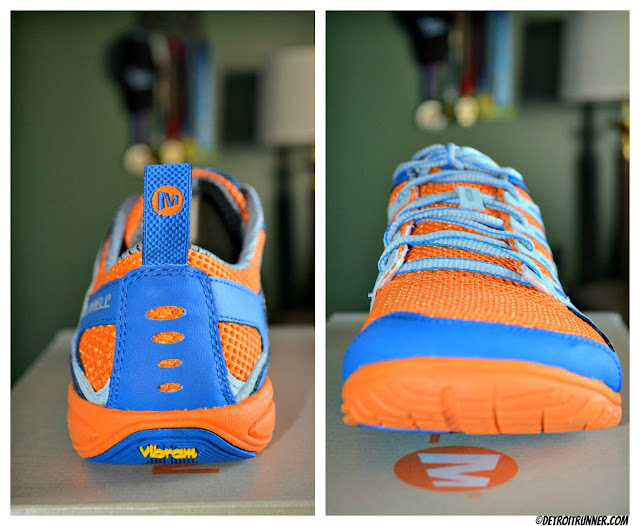 I specifically chose the Merrell Bare Access shoes because I wanted something with a little more cushion on them. These are still a zero drop running shoe but the bottom of the shoe has approximately 8mm on the bottom for cushion. Now this is not going to be any plush running shoe by any means but I needed more than the trail barefoot shoes I run in. These are made to run longer distances and while I have not built up enough miles in them to do a long run(mine is currently 19 miles); I was really looking at these as still primarily a foot strengthening shoe and for short distance(under 5 miles) run. I love the fit to the upper on the Merrell's. They have a wide toe box which I love and the heal fits snug but not overly so. They also feel like they wrap around my foot on top and my foot does not move around at all in them. Just the way I like my running shoes to fit. I still have to concentrate when running in these to make sure I'm maintaining a proper form but that's the point - I want to improve my form but still allow my foot to move naturally and do it without getting hurt. The back of the shoe has a nice little pull on it to help you get the shoes on and off. I've heard complaints of the heal digging into your foot. This didn't happen for me but then again, I don't typically wear these without socks. In fact, I don't wear any shoes without socks so my foot felt great. Also, I used the socks that Merrell supplied me and they felt really comfortable and fit nicely with the shoes. You can also see from the picture below how wide the front is for your toes - a great design. From the side, you can see there are several strips to help keep the shoes shape. Those strips help keep your foot in place and you can feel that "wrap" around your foot. A very comfortable fit. It's also a really great design as well. In regards to the bottom of the shoes, Merrell partnered with Vibram for their sole. Specifically Vibram helped in the heal and mid foot areas of the shoes. Of course, the mid foot is where it's going to wear but I've been using Vibram soles for my work shoes for years and they last a long time so I imagine the same will be true for these shoes. 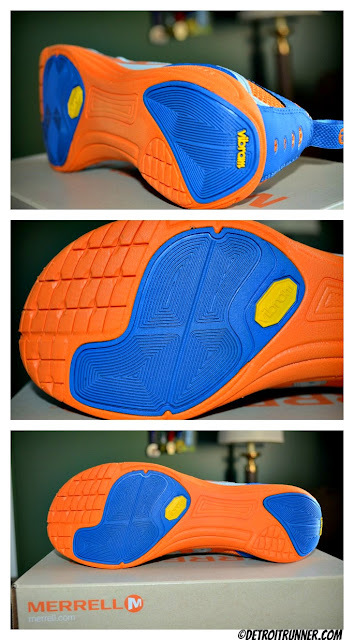 The Vibram sole helps give some great traction whether it was on cement, asphalt, or trails. I also wore the shoes for some everyday use and walking. Each time I wore the shoes, they became more and more comfortable. So much so that it doesn't feel like I have shoes on much when I wear these - that's the point right? In fact, I've started to use these as more than just a running shoe and find myself wearing them on a regular basis. The pullover is great since it matches the shoes I received. It's also a nice technical material that is very comfortable to wear on your run. In addition, it has a nice zipper that has a zipper housing. I love this feature because when it starts to get really cold, I'll be able to zip it up all the way and the zipper will not chafe my neck. The pullover is a very high quality product. I also really like the socks they make. The socks are no show type socks which fit just above where the line of the barefoot shoes are made. This makes them match quite well with the barefoot shoes. They also have a little more cushion in them which I like with the barefoot line and were really comfortable in all distances. They were also high quality. I still wish I could get used to running in these really long! 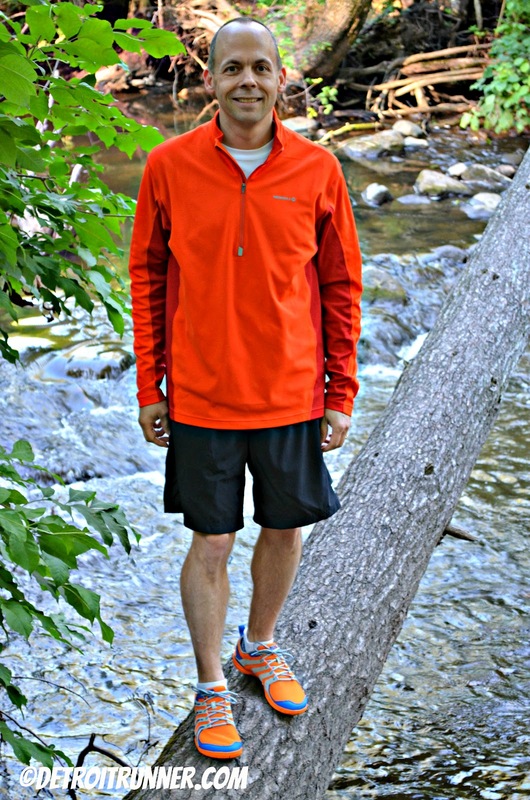 Interested in learning more about the Merrell Barefoot line? * Note - I received a complimentary pair of Merrell Bare Access shoes, a Merell pullover and two Merrell socks in exchange for this review. All opinions on this blog post are my own and I was not paid or required to give a particular opinion on the shoes. It's possible I might receive compensation in the form of a travel voucher should I win their contest. Dude, you rock that blaze orange! Voted for ya! Great review too...thanks! Thanks everyone. Please spread the word. Hoping one of my readers wins the shoes!